SPC 8971 is a mixed-media work on a wove paper support, possibly a collagraph print with freehand painting and drawing over the surface. The artist appeared to have mixed a modelling medium in with acrylic paint, and drawn a grid in pencil over the still-wet surface. This resulted in a surface which is shiny in some areas, matte in others, and has what appears to be a flaky consistency but is in fact stable. Small, slightly raised areas with halftone dots indicate that the artist pressed some type of printed material onto the object with either adhesive or acrylic medium before removing it, and the borders are shaded with graphite. Overall, the object was in good condition - with the exception of yellow staining, which will be discussed further - and it needed to be removed from its current mount, treated for adhesive staining, and remounted using stable materials. SPC 8971, while structurally sound and in fair condition overall, was suffering from severe staining on the verso and recto due to degradation of the media on the recto - at first judged to be oil staining, PVA staining, or the result of deterioration of the acrylic modelling media. It was determined that further testing would need to be done to identify the exact nature of the stain. The object had been mounted onto board prior to the artist’s submission, using masking tape to adhere the perimeter of the print to the board. As a result there was a significant amount of staining due to the masking tape’s advanced stage of deterioration, which was revealed once the tape was removed from the mount and print (Feller, 1982). Apart from the previously mentioned staining, the print was in good condition, with the thick paint impasto remaining solid with very little paint flaking. Overall, SPC 8971 was in fairly good condition and was originally intended to simply have the pressure-sensitive tape around the perimeter removed for re-mounting. However, the amber staining on the lower left of the recto was distracting to the elegant grayscale palette the artist had used on the object, and if it could be reduced without harming any of the media that would be a desirable outcome. It was decided to conduct further tests before proceeding to a treatment plan. Interestingly, there was a sticker on the verso of the mount indicating that the artist had applied for admission to the sculpture department of the Royal College of Art; this suggested that the mount was eventually reused for submission to the Slade Prize. Because this sticker contained information about the artist and her history it would need to be removed and replaced in the new mounting (Fredericksen, 2014). The decision was made to cut out this area of the mount and use backing removal techniques to thin the label down to a single layer for adhering to the new mount. Masking tape used to adhere the object to the mount board had oxidised, causing a discoloured stain around the perimeter of the object. Once the tape was removed from the object while unmounting it, any stains would need to be removed or minimised. The print was secured to its mount along the perimeter with two layers of masking tape, and upon removal of the top layer of tape it became apparent that the two layers were at different stages of deterioration. Several solvents were spot-tested on a small area of the exposed adhesive; ethanol and water, toluene, acetone, and toluene and acetone in a (50:50 v/v) solution were tested. Toluene was the most successful at swelling the adhesive so it could be scraped off, and after spot testing this solvent was confirmed to be safe for the media. On the top, or secondary, masking tape layer, the paper carrier was removed easily with a stainless steel micro spatula dipped in toluene and run along the underside of the carrier, which was then pulled gently away from the mount with a pair of tweezers. This left behind a sticky adhesive residue and the paper appeared transparent in this area.The primary layer of tape loosened with the toluene-dipped spatula. However, the paper carrier peeled away to reveal a hard, crystalline, difficult-to-remove amber coating - indicating that this layer of masking tape was in the final cross-linked stage of deterioration (Feller and Encke, 1982 and O’Laughlin and Stiber, 1992). A solvent chamber was created using a small jar with a piece of blotter soaked in toluene placed at the bottom. After ten minutes the sticky adhesive was able to be gently scraped away with the micro spatula, and carefully rolled with a cotton swab. The cross-linked, amber primary adhesive layer proved to be more difficult, and the toluene was brushed on the adhesive layer before being scraped away; care was taken not to apply too much of the solvent to the heavily cross-linked areas, as it could cause stress on the paper areas under the adhesive (Horie, 1996). After the bulk of the adhesive mass was removed, yellow stains remained on both the verso and (to less of an extent) the recto. A discussion with conservators yielded the suggestion of putting the object’s borders on the suction table and flushing them with solution of toluene and hexane (50:50 v/v) (Buchanan, 2014 and Townshend, 2014). A piece of blotter paper was placed on the suction table and overlaid with a sheet of Bondina nonwoven polyester. An area three inches long and just slightly wider than the adhesive stain was left uncovered. After testing the solution of toluene in hexane (50:50 v/v) and finding that it worked very well to remove adhesive stains without causing tidelines on this object as well, the solvent ‘cocktail’ was brushed onto the stained area of the recto with a small brush. Any lingering brittle, cross-linked adhesive was then gently scraped off with a small scalpel. Prior to treating the stained area, the entire object was examined in transmitted light to confirm whether the staining on the verso was only in the areas of media on the recto. This indicated that the areas on the verso which were stained corresponded to the most heavily-applied areas of media on the recto. The amber stain on the left-hand edge of the recto seemed to result from the small area of media in the centre of the discoloured area. When exposed to UV light, the painted area and stain absorbed light with no fluorescence. Clearly, the staining on the verso (and recto) of the print was the result of a substance in the media; some sort of modelling medium, PVA, an acrylic binder and varnish such as Rhoplex, or a component of the paint itself. 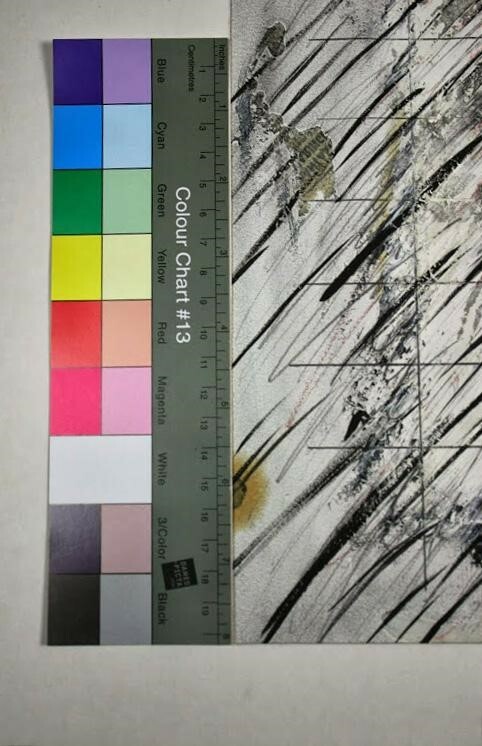 As it was difficult to determine where the mystery stain originated from exactly, two very tiny paper fibres were taken from the verso of the stained area to be analysed by FTIR (Fourier Transform Infrared) spectroscopy at West Dean College. Readings were inconclusive; the resulting graph showed that there were aldehydes and ketones in the substance but it was unable to be positively identified. It is possible that the sample was contaminated in some way. This presented its own difficulties, as without knowing exactly what was causing the stain, the only solution was to bleach it - a treatment which would alter the graphite layer and potentially leave an unsightly ‘bleached’ area. A discussion with other conservators led to the conclusion that what seemed to be a dead end in treating the stain was merely the acceptance that the stain, for all intents and purposes, was part of the piece (Kosek, 2014 and Bainbridge, 2014). As the staining wasn’t harmful to the structural integrity of the object, the decision was made to acknowledge it as an aesthetic reflection of Amanda Ryder’s exploration of nontraditional materials, and ‘a continuation of an experiment begun at an earlier time’ (Keynan, 1994, p. 77). The stain was left as it was.